Tên đầy đủ của sản phẩm phải được cung cấp, theo trình tự sau: tên nhãn hàng, dòng sản phẩm (nếu có), tên sản phẩm. Nếu là một màu riêng lẻ đ­ược công bố thì ghi tên màu và số màu (ví dụ: L’oreal Feria Color 3D Hot Ginger). Nếu có nhiều màu thì tên và số màu của mỗi màu phải đư­ợc công bố. The complete name of the product should be given, in the following sequence: brand name, line name (if applicable), product name, if a single shade is notified, the shade name/number (e.g. L’oreal Feria Color 3D Hot Ginger). If there are different shades, the shade name/number for each shade shall be declared. The illustrative list is not exhaustive and you can include other types of cosmetic products not in the list by selecting others and specifying what it is. More than one category can be selected, e.g. ‘Bath or shower preparations’ and ‘Hair-care products’ can be selected if your product is both a shower gel and hair shampoo. This refers to the function or use of the product and not the directions for use e.g. to moisturize the face, hand, etc. “A single product” exists in a single presentation form. “A range of colours” is a range of cosmetic products, which are similar in composition and produced by the same manufacturer, and are intended for the same use but are available in different shades of colour (e.g. lipsticks, eye shadows or nail polish but not composite packs of different types). “Palette(s) in a range of one product type” refers to a range of colours as defined above, which may be presented in a series of palettes. “Combination products in a single kit” refer to similar and/ or different product types packed and sold in a single kit. They cannot be sold separately (e.g. a make-up kit of eye and lip colours; a set of skin-care products sold in a single kit). There may be more than one manufacturer and/or assembler for one product. The full names and contact details of each of them must be submitted (If the address of main office and factory of the manufacturer are different, it is required to notify both of them). A manufacturer is a company which is engaged in any process carried out in the course of making the cosmetic product. The manufacturing process includes all operations of bulk intermediates and products, formulation and production (such as grinding, mixing, encapsulation and/ or packaging), quality control, release and the related controls. – Công ty đóng gói chính là công ty tham gia vào qúa trình đóng gói sản phẩm vào bao bì đóng gói chính/ trực tiếp, bao bì này được hoặc sẽ được dán nhãn trước khi sản phẩm được bán hoặc phân phối. A primary assembler is a company which is engaged in a process of enclosing the product in a primary/ immediate container which is labelled or to be labelled before the product is sold or supplied in it. A secondary assembler is a company which is engaged only in a process of labelling the product container where the product is already enclosed in its primary container and/ or packing the product which is already enclosed in its labelled primary container into a carton which is labelled or to be labelled, before the product is sold or supplied. 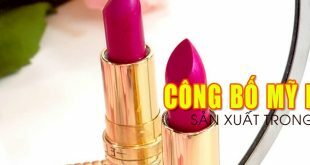 It refers to the local company responsible for placing the cosmetic products in the market, which may be a local manufacturer or an agent appointed by a manufacturer to market the product or the company that is responsible for bringing in the product for sale in Viet Nam, etc. The business registration number or its equivalent should be indicated in the notification form, if applicable. The person who represents the company to submit the product notification must possess adequate knowledge or experience in accordance with the legislation and practice of the Member Country. Materials used in strictly necessary quantities as solvents, or as carriers for perfume and aromatic compositions. Nồng độ của các thành phần phải được công bố nếu như đó là các thành phần nằm trong danh mục hạn chế sử dụng được xác định trong các phụ lục của Hướng dẫn về mỹ phẩm ASEAN. The percentage of ingredients must be declared if they are substances with restrictions for use as specified in the annexes of the ASEAN Cosmetic Directive. For combination products in a kit, list each product and its corresponding formulation individually. You can extend the form when more space is needed.